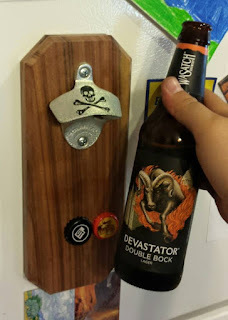 In the tradition of doing something snazzy for the DEF CON Toxic BBQ, I created a bottle opener that would both mount magnetically as well as catch bottle caps with the same force. Amazon had a selection of sturdy bottle openers by Starr X, and a particularly helpful blog post by K & J Magnetics helped me pick out the featured magnet. I'm relying on the interesting grain of the Indian Rosewood to give the piece character as I didn't have the tools to do a fancy profile, and my router bits are incredibly lacking, so I just went with dog-eared corners and a chamfered edge. The burning visible on the below pre-finishing shot (accompanied by my favorite Wasatch brew) was due to the bit I used. The magnet was epoxied in place after I cleared out a spot for it. In order to prevent the opener from sliding on slick surfaces, I added slightly inset tiny rubber feet. This also set the opener off from the fridge by just enough that you can get your fingers behind it to pry it off with ease. Lots of sanding from 100 to 600 grit made a great smooth base for some stain and spar urethane. After three days of curing time, I plopped it on the post at the Toxic BBQ and had a pile of at least 50 caps by the time the night was through. A great first run!